Luzeiros Hotel, Fortaleza, Brazil details from BrazilBookers.com. Hotel Luzeiros Fortaleza is located at one of the most active avenues of Fortaleza, near the main business centre of the city, giving you a direct view of the beach. Luzeiros Fortaleza is also close to many tourist spots of the city. All the rooms of the hotel have cable TVs, digital safes, balconies, air conditioning, digital safes and work desks. Tremembé, the lobby restaurant, serves the guests with international cuisines. The hotel also has another restaurant, the Restaurant Almofala. Besides that Luzeiros also comprises of a poolside bar and the lobby bar, Mundaú. A fitness centre and massage parlor are also there for the comfort of the guests. 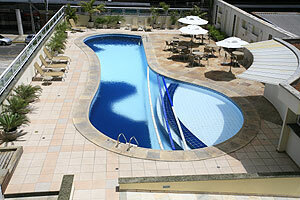 Luzeiros hotel in Fortaleza, Brazil, has a great location and is considered to be one of the best hotels in that locality. 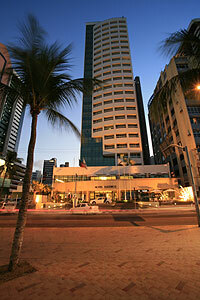 The hotel is located along the road av beira mar. The nearest international airport is about 8 km away. It is quite near the center of the city. There are many famous night hangouts near to the hotel so the tourists can take a feel of the night life of the amazing city. The hotel looks exotic being in white and overlooking the beach ‘Mereiles‘, one of the most breath taking beaches of Fortaleza. It looks like a normal building with lots of angles all painted in a monotonous white pallet and a complete lack of curves but the immediate outside pool is extremely chic with whitest sun bathing chairs near the pool adding on to the exquisite feel. There are 202 rooms in all which come in 3 categories- single double and triple. Most of the rooms have the striking view of the sea from the balconies. All the rooms have the same style more or less with light colors used often. The rooms are provided with all the basic modern amenities like air conditioning, attached bathrooms, hair dryer, in-room safe, key card system, a mini bar, refrigerator, smoke alarm, smoke detectors, sprinklers, telephone and a television. The hotel has a lavish pool just outside the hotel. Tourists can relax there after a whole day of traveling. Public parking is also available at a surcharge of BRL 9.00 per day. The tourists have the choice of dining at two restaurants- Almofala and Tremembe. Both the restaurants serve more or less the same delicacies. Restaurant Almofala has a very alluring ambience with the wooden floor and cane furniture complimenting each other. The service is quick and the food is gastronomical in both the restaurants. The restaurant Tremembe has a more chic feel to it. Both the restaurants are very stylish and in a way very earthy. The décor harmonizes with the surroundings. The hotel also has a lounge and a bar. The bar is quite posh with the superb service and amazing range of cocktails. The hotel is a retreat to the business travelers and tourists of the city who want to stay connected with the modern day amenities. The price is very reasonable suggested by the reviews. Most of the reviews of the hotel indicate that the guests were exceptionally satisfied with their stay. This is no doubt the best option in Fortaleza if the tourists want to have a feel of the busy hour of the city too. Booking of the hotel can be done online. When would you like to stay at Luzeiros Hotel ? 1) Rates at the Luzeiros Hotel may not be valid during Carnival, New Years, Easter and other special dates. © Copyright Bookers International, LLC. All Rights Reserved – Information on Luzeiros Hotel, Fortaleza, Brazil details from BrazilBookers.com.